Jason Kingsley OBE is CEO of Rebellion Video Games, and a lifetime enthusiast of the equestrian arts and medieval history. One of the challenges of studying history is to avoid looking into the past with a myopic view – to think that people of times past were somehow more simplistic, predictable, or uniform than we are today. When we study a historical period like the Middle Ages, we should strive to appreciate the depth and complexity of individuals who lived in that world, to recognize that people in the past pursued various (sometimes even bewildering or contradictory) interests, ideals, and vocations throughout their lives – just as we do today. A single, hour-long historical documentary, no matter how well researched and presented it is, risks giving that sort of tunnel-vision image of the medieval world, and (particularly) knights who lived in it. How many TV shows have you seen that give you the impression that each and every man of knightly status in the medieval world wore armor, went jousting, and was constantly preparing for battle? For another approach to understanding the life of a Late Medieval knight, you might want to check out a documentary series called “The Knight” on the YouTube channel Modern History TV. 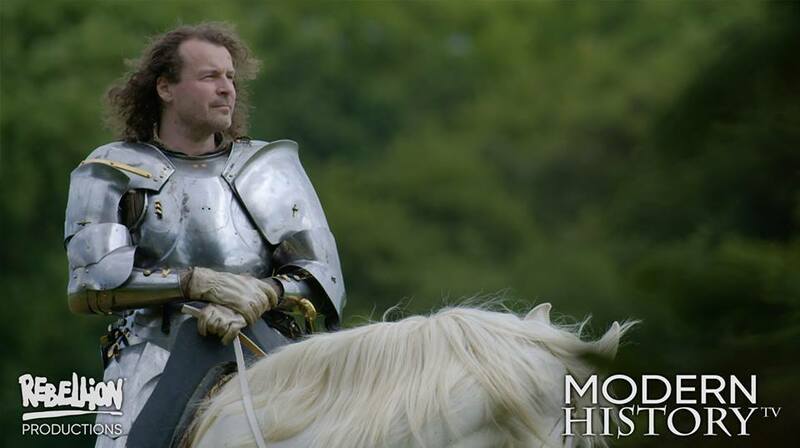 This series of 32 episodes (plus lots of behind the scenes “Knight Extra” shorts) strives to present a well-rounded, very human image of the medieval knight in a way that – perhaps – no other documentary project before has done, exploring armor, swords, jousting, and war horses, yes … but also cuisine, fashion, hobbies, society – and the ideals of chivalry that were interwoven through the culture of the period, even as the role of the knight as a figure of military dominance was on the wane. Just what does this video series have to tell us about the world of the Late Medieval knight that’s different from anything you can find in a history book? Can exploring the professions, material, and culture that surrounded medieval knights give us more understanding about the people who wore armor and rode to battle in the Middle Ages? And is there a lesson to be learned about the relevance of chivalry today by following along on this one-man journey through the exploration of “modern history”? Jason Kingsley is CEO of Rebellion Video Games, and it was under his guidance and creative vision that the company’s Rebellion Production division produced the “Modern History” documentary series. Fulfilling the job of host and narrator, Jason accompanies viewers through the world of the medieval knight as he sees it – with curiosity and enthusiasm, but also with objectivity and clear eyes, as he looks not just at the elements that created the iconic image of the “knight in shining armor” but also how military tactics, sports equipment, fashion, and even business practices today are still, to a degree, affected by medieval history. Jason joins host Scott Farrell in this episode to talk about his quest to explore the ideals of chivalry in both his personal and professional endeavours.